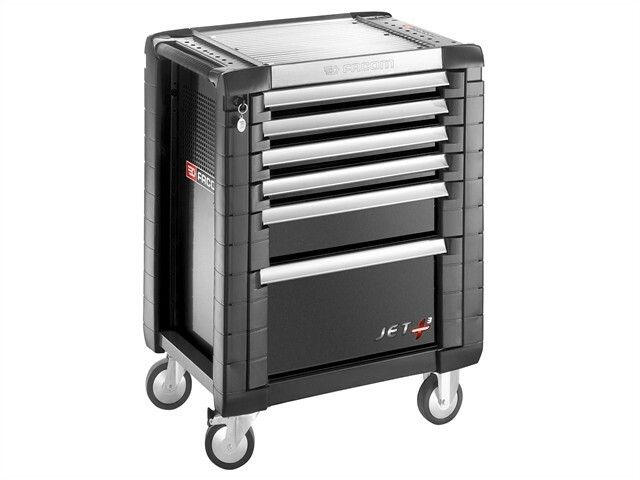 The Facom JET.6GM3 Jet3 series 6 drawer cabinet is a rugged, highly durable storage cabinet. It has two 60mm high drawers, one 130mm high drawer and one 270mm high draw. It provides plenty of storage space and practicality, being set on four caster wheels for ideal manoeuvrability, and is suitable for all workshops and garages. Supplied with 6 partitions for 60mm drawers and 2 partitions for 130mm drawer. 2 x 60mm high drawers = 12 modules. 1 x 130mm high drawer = 3 modules. 1 x 270mm high drawer. Total Load Acceptable in the Drawers: 140kg. Useful Storage Volume: 155 litres. Overall Size: 97.1 x 77.4 54.6cm.